A good pair of sunglasses is an essential part of any drivers collection of helpful items, especially if you live in a state where you can expect a lot of bright sunshine. 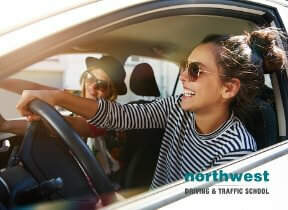 Sunglasses can also be a good option if you’re driving on very sunny days, where that bright sunshine can throw dazzle up from the road can affect your view of the road ahead. Sunglasses can also be useful in winter, or if you live in a colder state where the sun is low in the sky or light is reflecting off snow and ice on the road surface. If you don’t have a pair of sunglasses and you’re about to rush off an buy some, read the rest of this article first to make sure you are buying a pair that will give you the most practical use for driving. The Food and Drug Administration (FDA), part of the United States Department of Health and Human Services actually sets minimum standards for sunglasses sold in the US. What this means is that each pair of sunglasses produced for sale to American consumers must be manufactured to the following guidelines. Not all sunglasses provide the same level of tint, some are darker than others and are therefore more suited to certain conditions. Some pairs of sunglasses, particularly those produced for skiing are just too dark to drive in. To help grade sunglasses, the FDA uses ISO international rules to split glasses into catagories based on what conditions they work best in. When purchasing sunglasses for driving, always try to get the grade that matches up with the light conditions you are most likely to face. There’s not much point in buying grade one sunglasses if you driving in the desert, and grade four glasses, which only let it 6 to 8% of naturally occurring light, are best left of the ski-slopes. A good sunglasses stores should be able to tell you how much tint there is in the glasses they’re selling and which glasses are best suited for driving. If you’re buying your sunglasses online, it is important to check this information before you buy and, if you have any doubts at all, contact the seller to check the grading before you buy. Experiencing glare or discomfort while you are driving may not be a result of the light conditions. If you notice anything different about your vision while driving, such your vision blurring, eye pain, or consistent headaches then it is vitally important that you get your eyes checked by an optician.